Throughout her long musical career, Lynn enjoys mentoring flute students as a private flute instructor, and teaching beginning and intermediate school band at ʻIolani School. She is active as a flute clinician, on faculty with the Pacific Music Institute, and works with various band programs on Oʻahu. Lynn is adjudicator for the annual Select Band and Hawaii Youth Symphony programs, as well as Solo and Ensembles festivals. 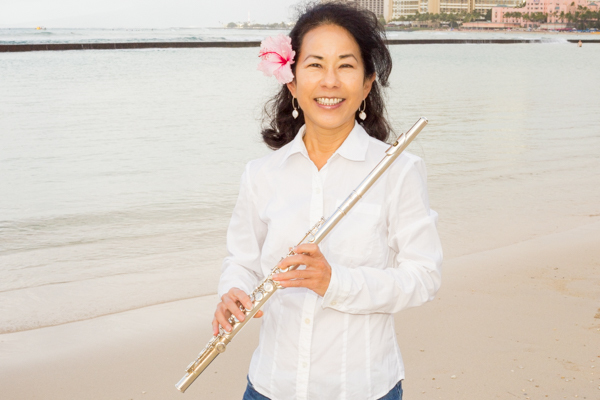 As a performer, Lynn was principal flutist with the Maui Symphony, substitutes with the Royal Hawaiian Band, and is a member of local community bands. Her mentors were Jean Harling, Edward Kanaya, Richard Hahn, Ken Andrews, Kenton Terry and James Pellerite. Lynn feels honored to serve on the HFS board as its first president, continuing the legacy and passion of her mentors, and creating opportunities for flute enthusiasts to share, connect and perform.